The helpful folks at NPR have released a collection of fully customisable, open source tools to help journalists create visually engaging images for social media. The tools – called Quotable, Factlist and Waterbug – were announced last night by Brian Boyer, editor of the NPR visuals team, as an easy way "for you to create those fashionable social graphics for your news organisation". Get hold of a demo version for Windows or Mac on the NPR blog, where there are also some handy guidelines, or dive straight in over at GitHub to get the source code and make the tools your own. And yes, it only takes some basic editing skills to knock up an image template for your organisation and drop different text in every time. But the Lunchbox apps have a good balance of variety and structure to speed up the process and can be used by any member of the team. 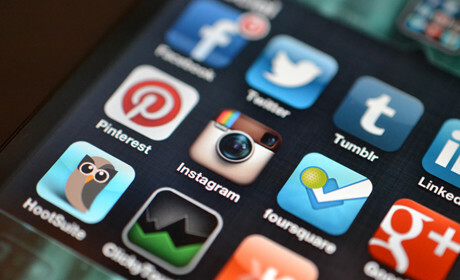 And research into social networks regularly shows that posts with images get higher levels of interaction. If a source gives an absolutely killer quote, you may want to have that as the main hook for the story when it goes out on social. The above quote from former Toronto Mayor Rob Ford was, perhaps unsurprisingly, the headline for many outlets when they ran the story, but a few words in a tweet and a branded pic of the quote may work better if it is from an exclusive interview. Quotable builds this for you, with a slider for the font size, four customisable themes to change text and background colour, and a quick option to change the aspect ratio for the different image dimensions on, say, Twitter and Instagram. Information may be scarce in breaking news situations, but it is important to establish and publish the verified facts of a story as quickly as possible. Check out any liveblog worth its weight in caffeinated energy drinks and you will see a bullet point list of facts at the top. 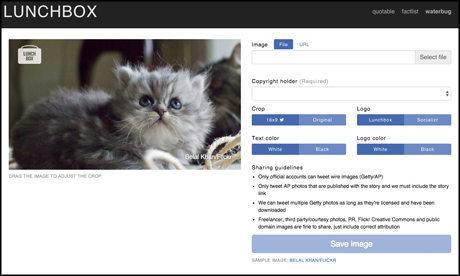 Images are more noticeable than text on social media, so it may be more effective to get the information out using the kind of images the Factlist tool creates. It has the same options for font size, theme and aspect ratio as Quotable, and will even add an automatic timestamp if you want to be clear about what happened when. The tool needn't be restricted to breaking news situations though, as Boyer proved when announcing the tools last night. "An image is worth a thousand words..." yadda, yadda, but when 140 characters averages at around 30 words, an image can make a big difference. And sometimes the picture is the biggest part of the story anyway. The problem though, as any picture desk or photographer will tell you, is that social media is still a Wild West of theft, fraud and confusion when it comes to copyright. So Waterbug adds an automatic watermark of your organisation's logo or name and lets you quickly add the proper copyright attribution for the image. In fact, you can't save the image with the watermark without adding the copyright attribution. Other options include making the text colour light or dark, dependent on the image itself and toggling the aspect ratio, as before. 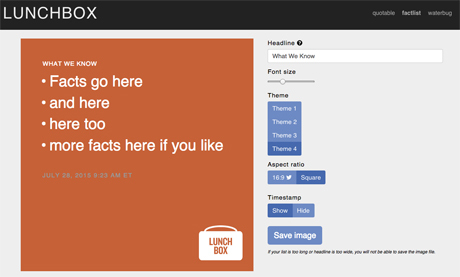 The Lunchbox GitHub page has all the necessary documentation and information for customising the tools to suit a particular outlet's branding, and there are some good, practical dos and don'ts on the NPR blog, where you can also download the demo to play around with. 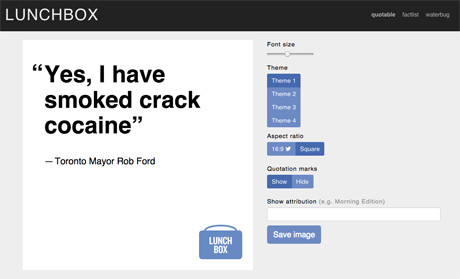 If you want to try some different styles, The Times and Sunday Times digital development team released a web-based image generator app in March, called CardKit, and Vox Media put its Meme Generator tool on GitHub last September. If you want an even greater array of tools, colours, fonts and themes then check out Canva, although you have to pay for some of the options in the app.